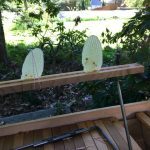 Some new top bar beekeepers had reached out to me to talk about top bar beekeeping. 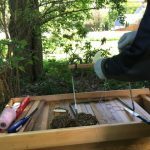 We met up at The Maynard Honeybee Meadow and spent some time talking about top bar hives and their management. 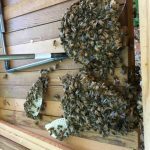 They had recently installed their bees into the top bar hive that they built and they had lots of questions. We have all been there! 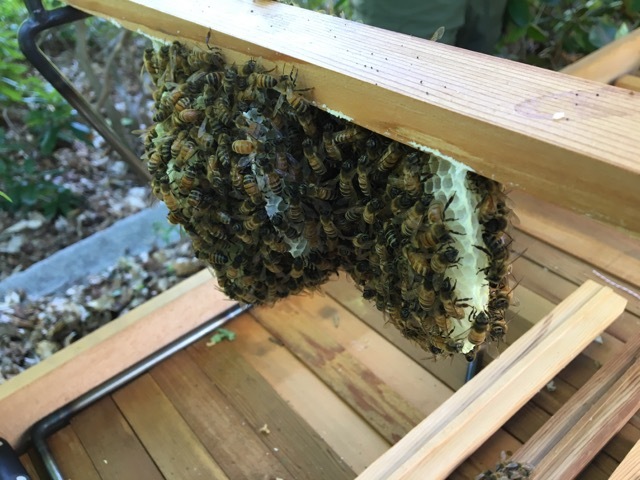 My first year beekeeping, I had no idea how to find other top bar beekeepers and I had questions that Langstroth hive keepers couldn’t answer. 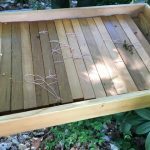 This blog is a result of the lack top bar beekeepers when I started. I knew that I couldn’t be the only person looking for others to talk to. This is how I decided to deal with that, putting my story here for people to find if they needed. 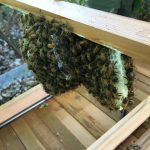 When I first started the blog it was just about writing my experiences and now I want to be able to help other beekeepers and provide support for top bar and treatment free beekeeping. It brings me joy when people reach out to me to ask questions of to have me come help them with their hives. After our discussion that day in the meadow, they asked me to come and take a look at their hive with them. 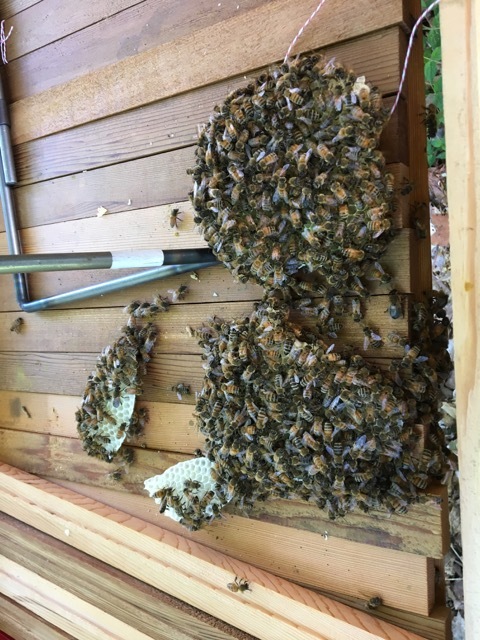 The bees were building cross comb and making a mess out of their hive. One of the first things that I noticed was that the hive was not level. 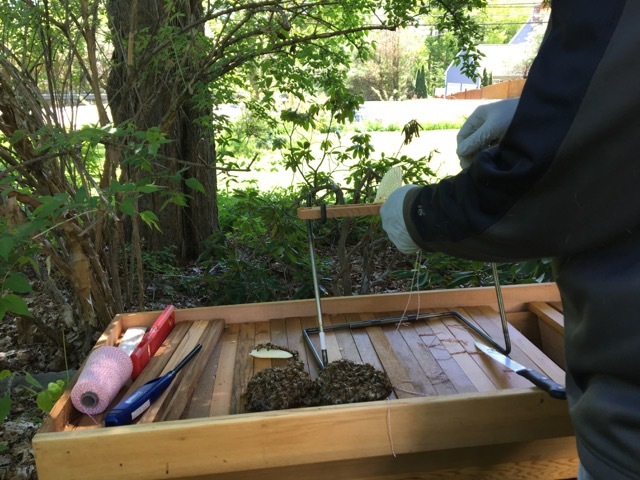 When top bar hives are not level, the bees with build their comb to make their nest level. This means that it won’t be built the way that the beekeeper needs it built, it will be crossed and unmanageable. There were some bars that had more than one comb being built on them. One bar even had four different combs on it. The second issue that we ran into was that the bars did not really have a guide for the bees to build off of. 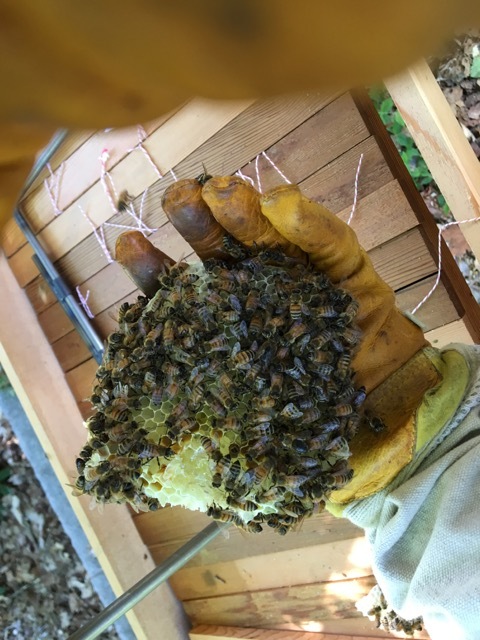 All of my bars have a triangular guide on them and the bees have been very cooperative building their comb straight down off of the guide. We talked about this and the other reasons why the guide is helpful. 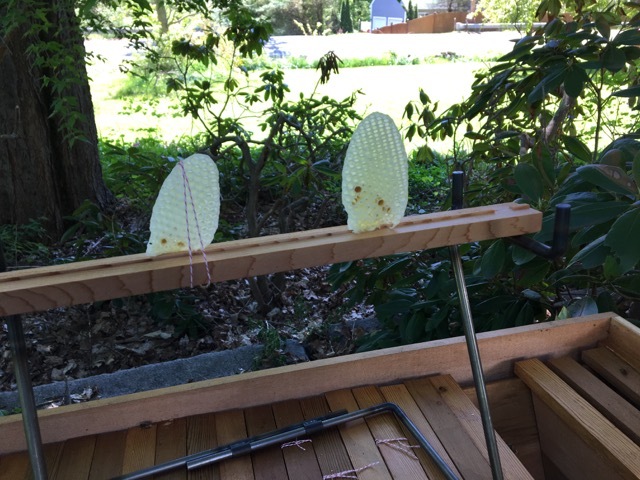 With the guide, the bees actually start their comb further down on the bar. 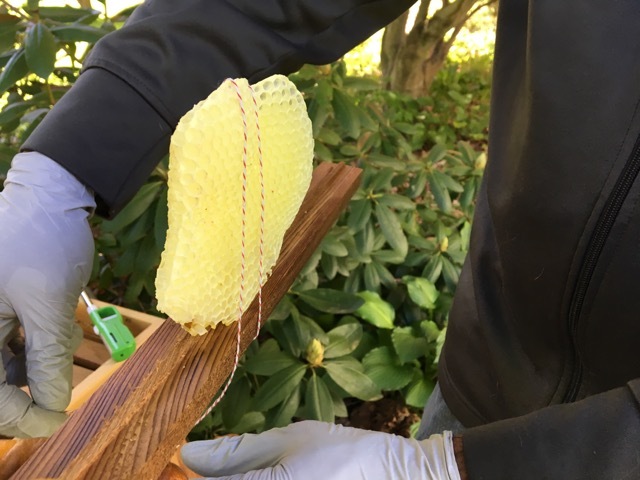 This means that when you are inspecting the hive the bees will be down a little bit and less likely to get squished between the bars. 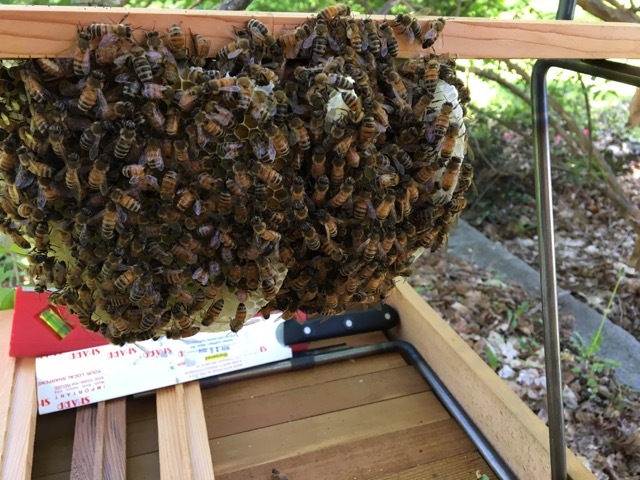 We inspected each comb to make sure the queen was laying. She was, we found lots of eggs in the combs. The comb that the queen was on was straight enough, so we did not do anything to that one. We put it back into the hive to keep the queen safe. The other combs were going to need some serious intervention. We broke each comb off of the bar and then reattached them. To reattach the combs, we used a lighter and melted the top bit of wax and quickly pressed it onto the bar. This worked really well, especially since all of the wax was very new and soft. Once we pressed the combs onto the bars we tied kitchen twine around the comb two or three times to support it. 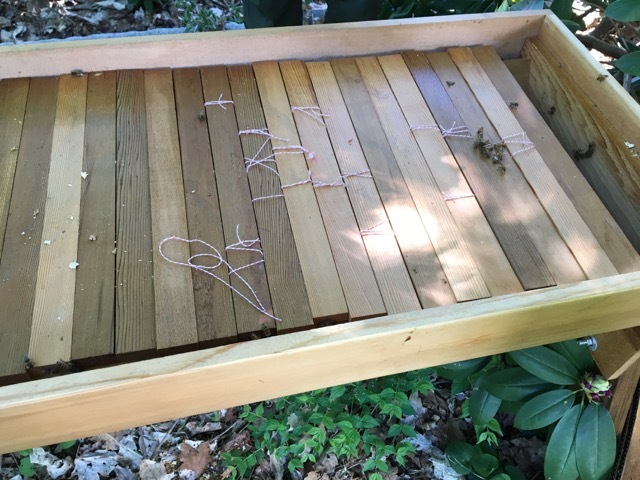 The kitchen twine is made from cotton, so it shouldn’t be a problem in the hive. The bees will build their comb over it and work around it. This process took some time and patience, but in the end it all worked really well. The bees were very calm and easy to work with even though we completely rearranged their nest. 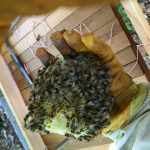 I let the new beekeepers know that they should keep a close eye on the comb building until the bees have several full combs built. 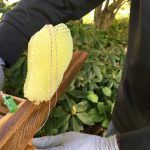 Once they have full combs built they can put empty bars in between two fully drawn combs to encourage the bees to build straight down. 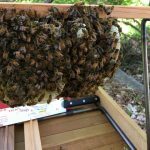 This was a very exciting adventure for me, I have been lucky enough to not have to have dealt with cross combing in my hives. It’s good for me to see this though so that I know how to deal with it when I run into it. It is also very fun to work with bees that are so calm and easy going. I thought for sure they would be very angry once we started ripping their home apart. My favorite part though was helping new beekeepers and answering their questions. Hopefully now they can keep the cross combing to a minimum and enjoy their first beekeeping season.